It’s no mystery that I have quite the love for working in concrete. My fascination with casting things from molds started as a little kid and led me to this. Before I knew it I had used a bunch of different Concrete mixes, made my own and created quite the slue of original projects. I learned from ‘hands-on’ experimentation to create my own easy system that makes it all mess free and simple. For many the idea of making concrete brings visions of huge metal mixers, shovels and mess. 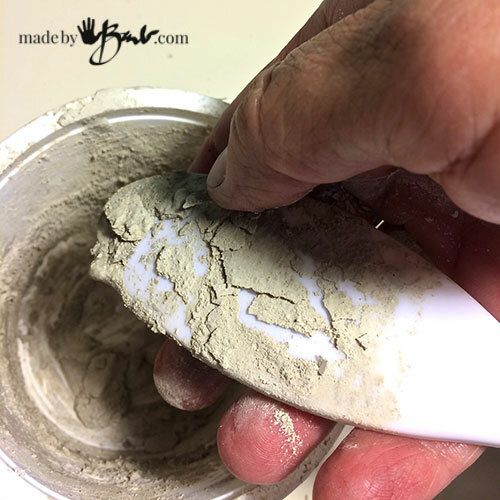 Let me show you some of my Tips and Tricks for Concrete Crafting so you too can make it all the time, like baking a cake. The term ‘concrete’ is for a material that is created from a mix of aggregates with a cement that is activated with water. Once it goes through it’s reaction, which usually involves some heat production it ends up almost as hard as stone. Lime-based Portland cement is commonly used and mixed with gravel (crushed stone) to make the typical mix used for your sidewalks. But as a crafter I often use a finer mix but there are still a few to choose from. Portland Cement can be purchased as is so that you can make your own mix by adding other aggregates. It is also used when making ‘HyperTufa’. 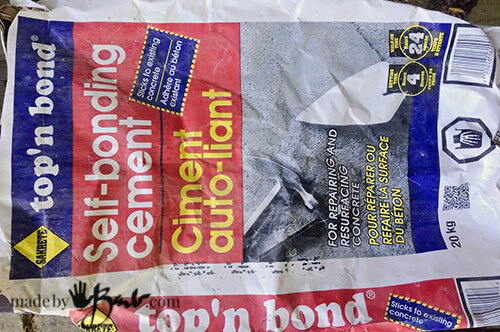 Depending what you mix into the portland cement will determine the final characteristics. It can range from just sand to perlite, peat, vermiculite, paper, styrofoam and probably more I’ve yet to discover. Sand Topping Mix is also one of my favourites. It is a simple mix of portland cement and sand. 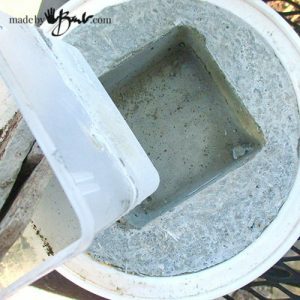 This inexpensive mix is meant to be used at less than 2″ thickness so it was perfect for the STEPPING STONES which were my first concrete adventure many years ago. They still grace my garden and are aging nicely. 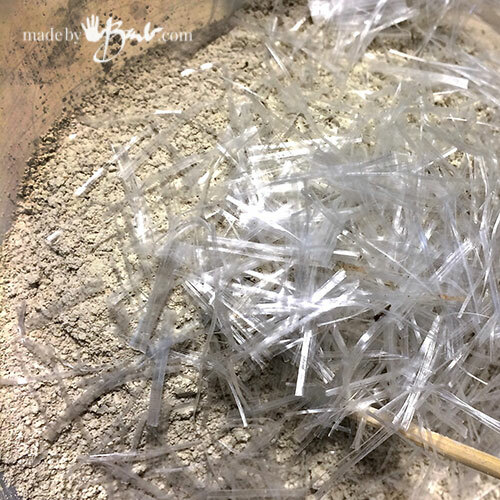 It has a fair strength when used at thicknesses over 3/8″ and worked well for the making of BOWLS and LIVE EDGE BOWLS and casting LEAF PLANTER. 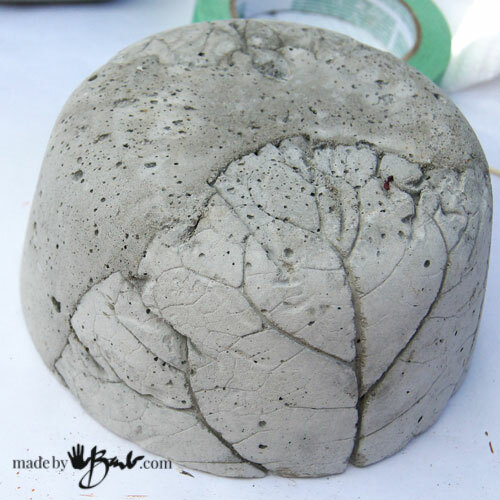 If you are new to concrete this is a good way to experiment. It can not be used at a very thin thickness. Setting time is not accelerated and will need a good 24 hours before unmolding. 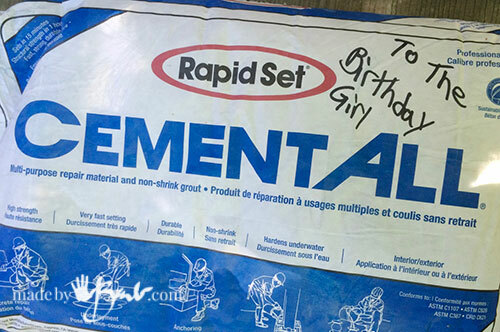 Rapidset Cementall is a brand name for a quickset concrete. 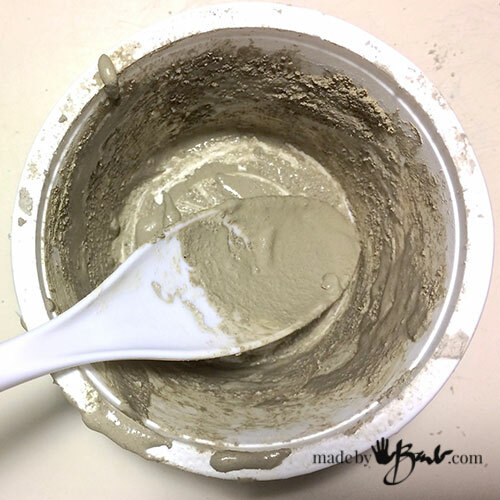 This mix acts quite differently as it sets really quickly (5 minutes) and can be unmolded in 1 hour. I love this mix since I am impatient, but also because it is super strong! I experimented and have used it at 1/8″ thick with good strength (obviously not walking on) as it my LEAF COASTERS. This mix can be used at different consistencies such as pourable or thicker malleable concrete. This pourability has allowed the ‘slush pouring’ of the CUTE HEADS and the TIN CANS, and even the EGGS. Thicker use has allowed the sculpting of the LEAF CIRCLES and the hilarious SMILING STONES. 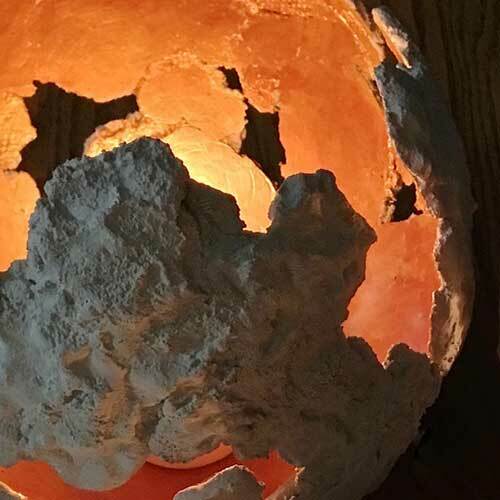 Even the GEODES and GEODE LAMP used this mix! There is something about this mix that does make the end product much finer though, as there are many additives to set it quick and add that strength. If you like the more rough industrial look this concrete has less of that since the aggregates are very very (powdered sugar-like) fine. Those are decisions you have to make. It is also more expensive due to those ingredients. If you would like to see side-by-side comparison of a few mixes visit my post about fast-set and extra strength mixes. Sakrete Top’N Bond is a form of a patching concrete which makes it adhere to existing concrete. It is sometimes called vinyl patch as there are added polymers. It has a good strength at minimal thickness and also some has malleability. The final product does have the coarser texture since there is sand in the mix. It has a medium setting time so it worked well for the GIANT ORBS since they are worked in stages. This is a what my collection of concrete ‘stuff’ looks like. It is really quite simple and I have quite the system now. Watering Can – is great as it just needs a bit of a tip to dispense, no fussing with a hose. 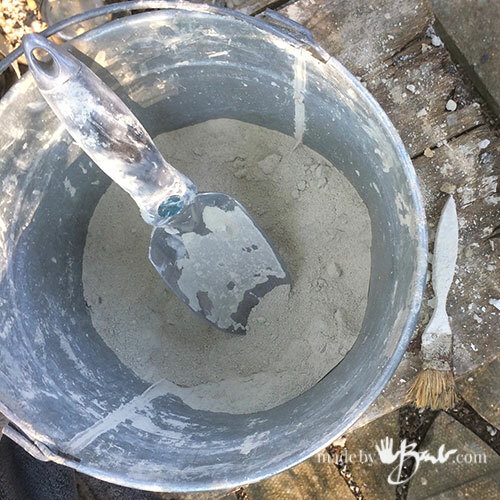 Bucket of Concrete Mix and Scoop – keep this scoop dry and in the container to be able to add mix when needed. Plastic Mixing Containers – It is best if these are not too rigid (Yogurt containers work well). Wider containers are better for mixing than tall ones. Measuring Cup to dispense small amounts of water into the mixing container. Rubber or Nitrile Gloves – better quality makes them last longer. Dust Mask – rated for concrete silica dust I like my 3M8833 as it has an exhale valve. Optional; Additives – if making a custom mix like Hypertufa or Papercrete; peat, sand, perlite, vermiculite, paper fibres, etc. Use the measuring cup to add water slowly, mixing after each addition. The consistency that is needed will depend on the particular project and type of mix. The Rapidset Cementall works better if the water is added first. (each project tutorial also has details) Then follow the instructions to make your ‘great concrete project’. Do not wash anything, just let it set and dry. NEVER EVER wash it down the drain! It’s like NOT doing the dishes… We are not making a sidewalk here, usually just smaller objects. Once it is hard, just flex the container and the concrete will chip off. Bang it a bit and it will be clean enough for the next use. I like to use recyclable yogurt containers. Plastic buckets work well if you are working a bit larger scale. Flex the spoon as well and it will become clean too. Keep a bucket for all the cast off concrete. It can be used as aggregate later on or other planting uses. No mess or fuss! There may be times where you need a bit of assurance that your project won’t just crumble into pieces. In the big professional world they use steel rebar rods inside the concrete. We can use other methods of adding some reinforcement. Drywall mesh acts as a reinforcement that can be cut and covered with concrete. If it is visible after curing it can be burnt away with a little torch. You can also buy reinforcing fibres that are added to the mix. These work great as I have seen pieces that crack but hold together since there is the cross lacing of the fibres. Anything that does not stretch can act as a reinforcement. 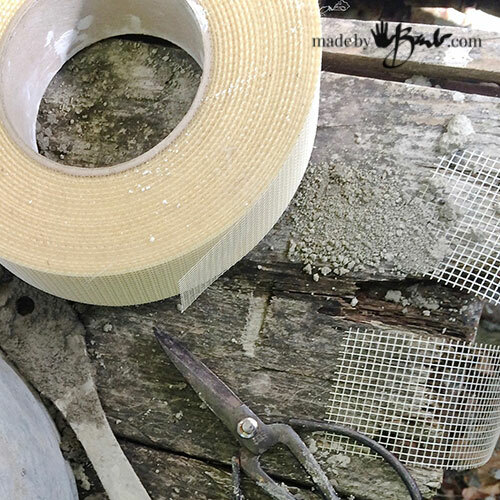 Chicken wire, other metal mesh, yarn, wire, even fabric will add strength. I admit, I hate sanding! I do not want to make a cloud of dust! So I design ways to keep that part to the minimum. That is why I like the rustic edges. 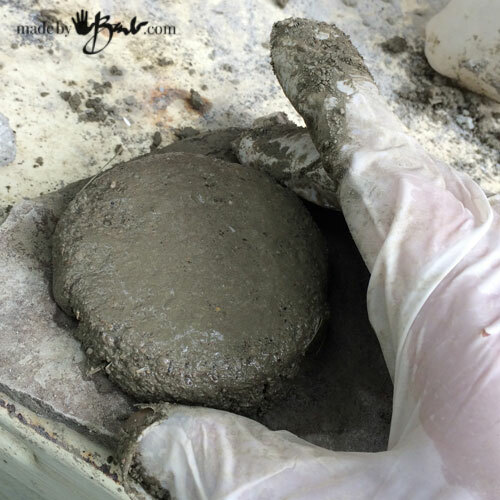 There are times where you may have mixed a bit too much concrete, don’t throw it away! Make a ‘patty’ on some smooth surface (plastic is best) and let set. This is now a great ‘sanding disc’, instead of using sandpaper or emery cloth. Also if you work with the pieces wet, there will be no dust and it will work well enough to take off the sharp corners. So, there you have it! It isn’t as bad as you had imagined?! I hope I have taken away some of the fear of being covered in concrete. It is similar to working with plaster of paris but is much more durable. Go check out all the concrete projects I have and give it a shot! I know you can do it! I love this site of yours Barb! Sadly don’t have the work space–I’ll stick to crocheting.. Question: Did you post the picture of a somewhat turgid male member on purpose? Well, I have even resorted to small pouring of concrete in my basement when the weather does not cooperate! The coasters use so little mix that it’s easier than a cake. As for the member, yikes, it’s the thumb of the hand! Your the best. Thanks so much. Brab, I always love your site, always great ideas. 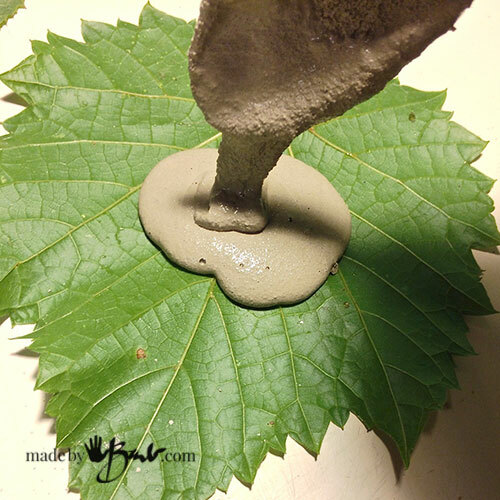 I make concrete leaves using vinyl patch cement and certain leaves always have more “bug holes” in the concrete than others. I pat the wet cement a lot but still they show up. Any suggestions. If you want really detailed prints maybe a layer of a quickset concrete like the rapidset cementall and then a layer of the other stuff. It is so fine it almost doesn’t even look like concrete. You could add the other layer within the hour. Or make sure it is a tad on the wetter side and really ‘slap-slap-slap’ the first layer. I use sand topping mix for my leaves. I just found your wonderful site. I’m new at crafting with cement and I LOVE it. Soooo many wonderful ideas to try. Keep them coming please. Sadly, it is getting close to the end of the season for outside ‘concreting’ here. I will be always thinking up new ‘concrete’ ideas! 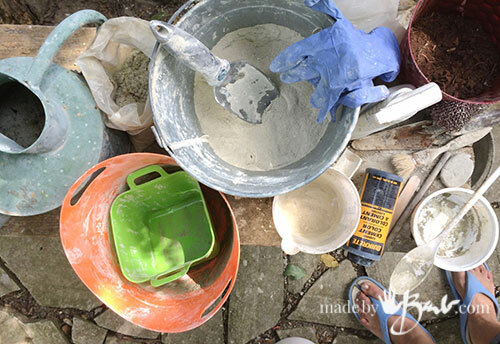 I have always wanted to try crafting with concrete, but haven’t dared to take the plunge. You help take the mystery out of all the different types of concrete (& availability), best uses and final results. I am making plans for next summer’s project(s). 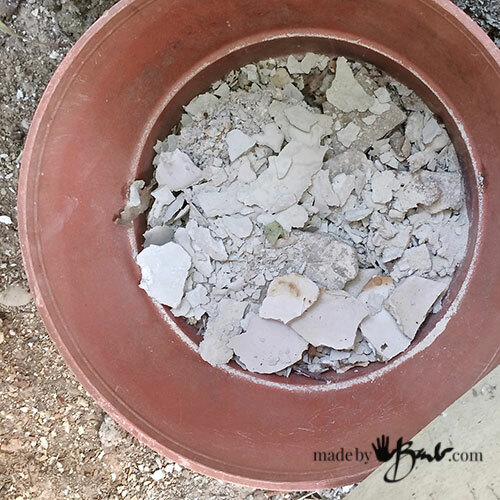 Have you heard of Shape Crete? What are your thoughts on this type of concrete? Yes, I have heard about Shapecrete! I did want to try it but I was a bit surprised at the cost per amount. It would be well worth it if you are not making a lot. I always like to figure out a cheaper way of doing my arts/crafts (maybe I do too many) and I like the availability for everyone. Maybe the ShapeCrete guys should send me some to test (hint-hint) I used to sculpt with real clay that needed to be fired and that is what it seems like. Honestly. I can’t keep up making all the ideas that pop into this brain of mine… If you try it let me know. Oh, thanks for letting me know. Yes, I love the RapidSet, so little waiting! Sometimes I pop a load of laundry in and pour a bit of concrete… both done about same time! Hi There! I don’t make the solid orbs as they use a lot of concrete and need the glass. I make other orbs that are hollow. Then I also don’t need to worry about bubbles so much. Maybe you would like the large ones and you could the quick set concrete for them, and add the layers. They will end up more rough though. If you want to use the glass, then why not use the sandtopping mix. It is a general purpose mix and you can tap and use s tir stick to get the bubbles out. I personally like the bubbles so that it looks like concrete’ not plastic. Good luck! Hi, I may not be understanding the orb making problem correctly. I made many different kinds and sizes by using old tennis balls, golf balls, etc. All sizes and not much concrete needed. Do you use any kind of sealer? Well, that is a good question… I personally like the look of aged old plain concrete. I find sealers change the whole nature of the concrete. Even the neighbourhood driveways that had sealers seem to look worse and need refreshing more than the natural ones. I am always hoping that some moss will grow and make it look even older. The Rapidset Cementall is so dense that the water I left in an untreated bowl stayed for days without leaching through. My ‘sandtopping mix’ bowls have been inside over a year and don’t leak, but do need a bit more watering due to leaching. I am a first-timer who would love to make a draped fabric “sculpture” out of concrete. I have an old shirt I would like to dip and then hang outside. I need guidance! Thanks! 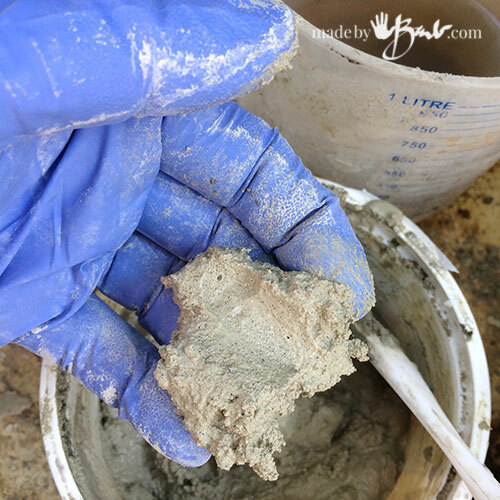 I have been wanting to try my hands on concrete Crafting , making hypertufa first (glad I found your website) but couldn’t find Portland cement here in Queensland, Australia. Any substitute? Thank you for THE best concrete tutorial ever! 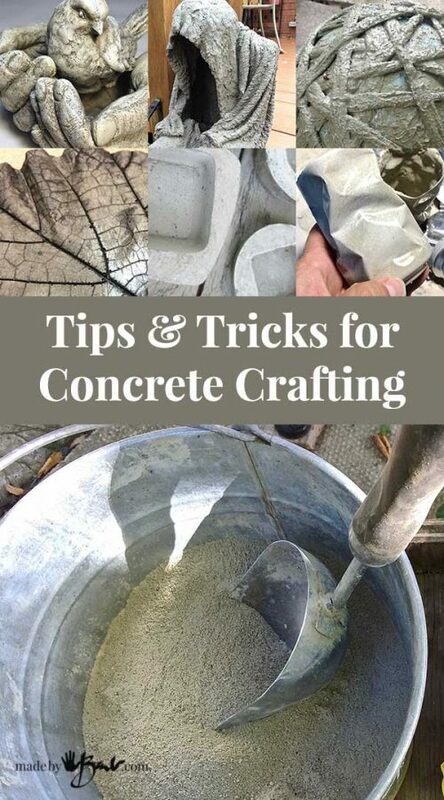 I’m just getting started with concrete and the information you have provided is awesome! 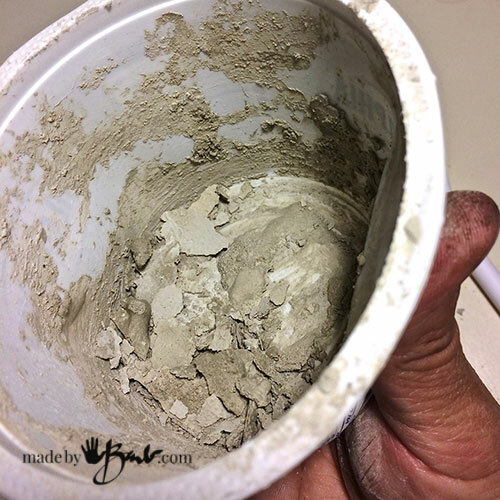 Hope you don’t mind me picking your brains but can you please tell me what you use to make lightweight concrete products? I’d prefer to not have aggregates show through the surface. I’m a bit stumped. Light weight concrete? Hmmm, some people make the hypertufa with the peat, perlite, vermiculite added in but I think that is not what you like since it shows on the surface. I have tried it as well but I am so impatient as it takes longer to cure and has a different consistency than I really like. It is much more porous. When I made the papercrete Bird it did end up quite light due to the paper content AND that he is hollow. Sometimes it takes a bit of thinking at how to design to create less bulk = less weight. Funny though; I had just picked up a small bag of styrofoam pellets (used as fake snow for christmas ornaments) and had an idea that involves concrete… I have yet to test it though. And sadly it is getting cold here on the other side of the world, not much concreting outdoors anymore. Draping can make lighter products as well, and hoping to post on that soon. Thanks Barb you’re a legend! There is a product called Citymix that is a lightweight additive for concrete http://citymix.com/ that looks interesting. Might be expensive but no harm in investigating. When do I add pelefix(for strength)? With water or after all ingredients in? Thank you do much for all this useful information! So many sites assume everyone already knows the basics. I learn by doing, so those are what I have realized from many years of crafting concrete. Enjoy! This post is so full of great info all in one place!!! Thank you so much for sharing!!!!! I’m interested in making some snowmen using concrete and unfortunately every blog I look at is in another language! I’d appreciate any thoughts on what type of concrete to use, I’d like them to be about 12- 15 inches tall. You have some great info on here thanks so much! Oh cool! I do have a few orbs as well as these snowmen These could be made smaller and then stacked on a stick or even tied together. Have fun! Hi barb!! Me again!! Snowmen turned out great.. used nylon hose for mold to hold together and I feel I let them set too long. That being said struggling a bit getting-them off any suggestions to soften the concrete to remove? I removed one the next day and it was a breeze but these have set on for about 10 days. Frustrated!!! This is the BEST tutorial I’ve come across!! I too enjoy working with cement but have struggled to get proper instructions. Thank you for your detailed information. AND the tips on not making too much of a mess!!! Cieszę się ze to lubisz! Can’t wait to try something. Have been saving molds. So very happy with your fantastic info. Amazing tutorial . Thanks for sharing your detailed knowledge . Thank you! This is the best , clearest, easiest to understand posting I’ve ever read on this subject. I have gathered most of what I need, a great addition to the creative clutter in my home! Now to find the time to just jump in and play! Thanks again for sharing! It was a long time in the making. I just learn by doing and hate having too much mess to clean. Glad it’s going to help! I appreciate the advice to use a spray bottle with water to mist when working with concrete. My driveway is all cracked and uneven, so I would like to work with a specialist in concrete products to help me fix my driveway. Getting a spray bottle and dust mask will be some tools I’ll get for when working with concrete. Thanks for talking more about Portland cement. As you talked about it, I thought about how the texture and consistency can change depending on what you mix with it. My wife and I are looking to put some concrete in our backyard, so I will contact a contractor this week to talk about the details. Thanks! I am glad you said to have a dust mask when working with concrete. My dad wants to create a concrete patio. Thanks for the tips on working with concrete. Crafters need to be careful! I hate dust! especially in my lungs! Glad to help! The choice of concrete mix makes the world of difference! I have not been able to find answers from anyone else so I thought I’d give you a shot. I have 2 life sized cement deer statues that were given to me. They are missing the cement on their legs and ears and a tail on one of them. What would you recommend as the best cement product to rebuild the legs and ears, etc? Do you have any suggestions as to the best way to do this….in layers or should i just sculpt the entire leg at once? The thickest part of the leg might be 3 or 4 inches at the hock. I appreciate any ideas, suggestions, instructions or what have you to help me to restore these deer. That is a tough one. It is probably going to be a lot of work nut maybe there is sentimental attachment to them.May they did not have any reinforcement in the legs and that is why they broke to begin with. Anything long and thin is apt to break. If you want to recreate tall legs I would suggest drilling a hole into the bottom for each leg and starting by epoxying some rebar (that is what is inside concrete slabs) Then you can add some metal mesh and build up an sculpt the leg(s). 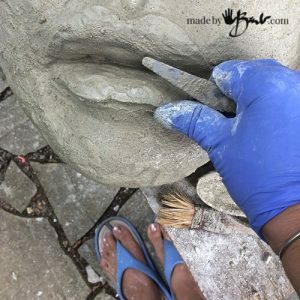 I am a big fan of the Rapidset Cementall since it sets really fast and that is how I sculpted the original face or you can use another quicksetting or vinyl patch concrete. 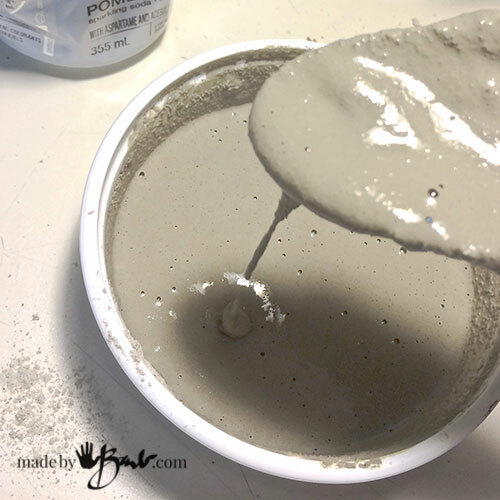 If you don’t build all at once just make sure you are not adding to completely dry concrete, wet it down or even add adhesion mix (like acrylic medium) before adding. I would just work incrementally without too much time in between. If it was whole new one it would be a different story but I bet the torsos are quite heavy so the legs need to be pretty solid. Same would be for the ears, a metal rod to get a start and some mesh… Let me know how it went! Hi Barb! I am beginning to work with cement making tiny art houses. I am making molds from 1/2 & 1/2 containers since they are waxed and won’t require a release agent. Since these are so small (.5”x.5”x various heights) I need to make a mix that is quite liquidy. Is it ok to just add more water to get a pourable solution? If so, how much longer is the dry time? Will the additional water result in a crumbling mess? Thanks! It will depend on what mix your use. The Rapidset Cementall states that it can be used in a fluid or or mose plastic state. Have used it in a more fluid state (for the monster eggs) and it still sets well and is strong. 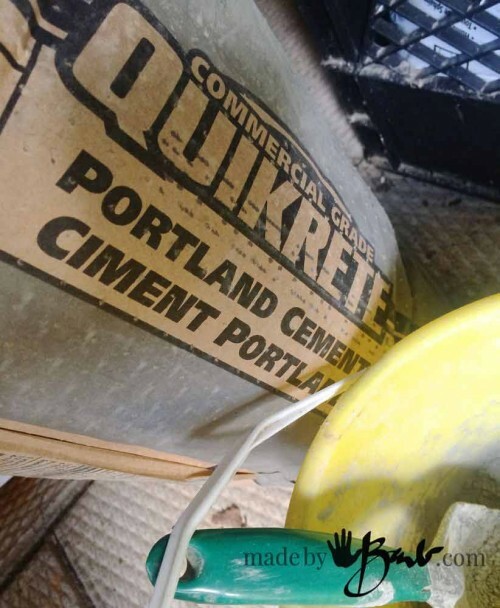 Quikrete has a version called Fastcrete. The finish is quite smooth and fine. I have problems with mushrooms. I use the nylons as my mold. Some, not many, have broken. The top just seem to fall off after a soft fall over…. Love making them but do not want to sell these cute Mushrooms if there May fall apart. I have tried several types of cement but would love your input. I have been mulling that idea in my head for a while. I hate to just regurgitate what is on the net so I wanted something comletely unique. Hint; use some plastic bottles as a form, possibly use some fabric soaked in concrete/portland cement and maybe some papercrete… I’m hoping to get to some this summer! See my witch, she has a lot of texture. I learn how things work mostly by experience. I guess adding portland and sand is like a hybrid fastset+sandtopping mix. So it may not be quite as strong as pure fastset. I am also hoping to try just adding dish-soap as that will add some air. In my mind of ideas the days are much longer! Barb, your tutorials and photos on concrete projects are the BEST on the web, Thank You!! I just completed my first doll head mold and pour. I might add that my silicone & corn starch mold initially had some thin spots where I had pressed it too hard. I simply applied some additional silicone directly from the tube to build up the thin spots and it adhered perfectly. —– I want to donate to your website, but only by PayPal. How can I do that? Thanks! Paypal is easy to set up and use with debit or credit etc. I have had a lot of good use of the silicone molds as well. I have also used the silicone to mend/fix. Happy concreting! I want to make smaller orbs to fill with water and float a votive. My vision is slightly more textured exterior on an orb about 12 inches. Any suggestions for which concrete to use as I may have to create in sections over a few sessions. The thickness could be up to one inch. Assume interior has to be waterproof as well-suggestions as to paint type? Have you seen these? They could be made with just concrete. I’d say they are still slightly smaller than 12″. I had the intention of testing some waterproofing last year. I used 3 vessels made with the Rapidset cementall and 3 different interior methods. What I found was that that concrete was so dense that the water did not penetrate at all over a length of time in any of them or even natural. Sooo, maybe you don’t need to coat the inside. I think it would be problematic to have a waterproof paint unless you use something like a pool paint. You could also keep them thinner as this is strong concrete (see these) Let me know how you make out Good Luck! 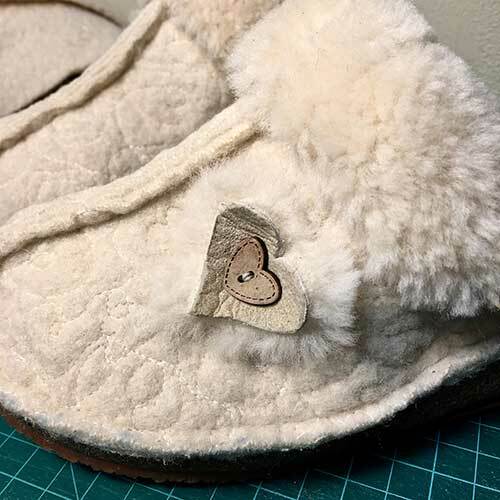 I’m looking for a way to cement my little daughters sneakers. You know, stick them out in the garden. I haven’t worked with quickcrete but I’m hoping the rapid set you mentioned works best. Any advice? Maybe you have dipped some boots for planters? I have some little rain boots I could ‘Crete instead of the sneakers. The rapidset does turn out the hardest and quickly. The problem is that in order to harden them the concrete needs to get into the fabric enough to build up some thickness. You could add repeated layers to thicken it but then the details are often lost. I find that the mixes have sand in them so its harder to get into the fabric. Portland cement will be more smooth to be able to impregnate the fibres. Maybe a combination of a good portland dip and then some extra layering… Have you looked at the Ghoul and witch? Hmmm, I suspect that it’s a wood box shape with a ‘half pipe’ hollow section. If there is a good thickness to the form you could use a simple Sand topping mix. If you are worried about cracking you could add some fibres or internal reinforcement metal or wire. It is strong enough for my Stepping Stones and finished pretty flat. If it is thinner you could use a RapidSet Cementall as it sets really fast and is much harder and smoother than usual concrete. I have not used the grout other than the mixes that state they can be used a non-shrink grout. I know it seems complicated when shopping for mixes as they have multiple uses. The RapidSet Cementall seems like a grout and does cure so smooth that it will shine if cast on a smooth surface. That is how I make the geodes You can add some colour to mixes as well. Thanks a lot for the super blog post.Hands down! Hi Barb, i am following all your fab work, i am interested in making the Draped Hypertufa Planters, i live in Ireland, and i see you use portland cement, is that just an ordinary cement, i can’t find the portland cement here only our Irish Cement, also is there any sand to be used, Many thanks for reading this and keep up the great work. Awesome ideas you have. I see recommendations elsewhere to not paint any concrete creations until it has set for 27-30 days. What say you? I made a sculpture out of clay but I want to make copies out of cement. I’m worried about crevices in the original. 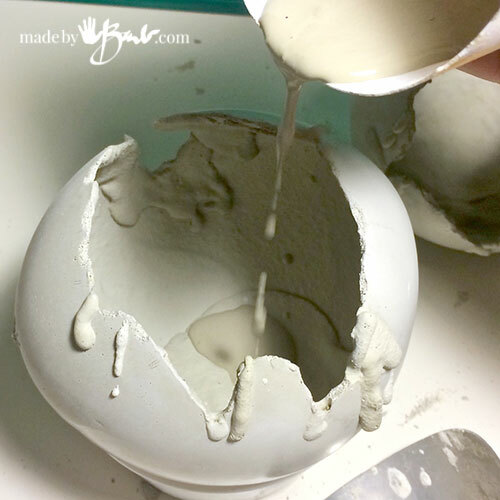 Do you have any advice for making molds and casting cement? See here: and also here You need to figure out where the seams or separation will be. Simple designs are best. How amazing is it that I can connect with the whole world?! Happy making! Barb thank you. You’re a great inspritation and all your tips are so helpful. I’m from India so you reach far and wide. Thanks! The world is so much smaller now! Happy concreting! 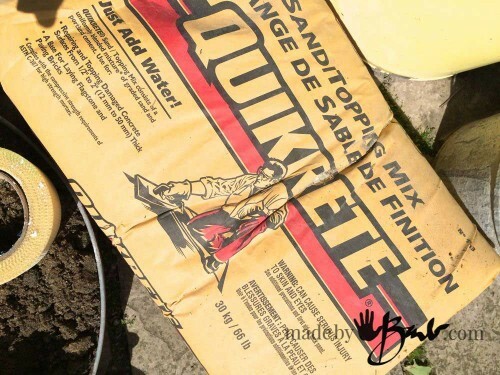 I have a question,I bought a bag of quikrete fast settings concrete mix. I bought this, because I am trying to fix a urn that is broken from the bottom. The thing is that it has gravel so..I swift it thinking it would be better without them. Well I tested by making a small pot just to see if it would work. Well when the required time was up for it to cure,I went ahead and checked the product..it turn to powder :(. How can I fix this urn? Or would it work if I just use it with the gravel,will it turn out good? Barb you certainly have many talents. I am enjoying working with cement but sure have a lot to learn. Reading your projects has helped in many areas. Still trying to figure out cracking and such but I will keep trudging on. Thanks for all your resources you have quite the selections on your site with soap and sewing. You bring lots of Joy!!! Hi Barb, love your posts. I’m just starting my concrete adventure, having loads of fun playing with different colours & moulds. However, all of my pots are EXTREMELY DUSTY. I don’t see anything on net where other people’s pots are very dusty. I’ve washed them, had them for a few days soaking in water & vinegar. However they’re still very dusty. I’ve been using Bastion 20kg Real White Cement & Westbuild 20kg Sand And Cement Dry Mix. I’ve searched high and low for information on a sealer, that is low cost & still safe for plants, but no one seems to use one. Also, I’ve tried sanding, using a lump of offcast concrete, but that doesn’t seem to achieve much. I think it is some particles of the concrete coming off. It may be specific to the mix that you use as I have not seen it happen with so maybe there is no extra particles. Give it a good scrub in/under water to get rid of the extra. I’m hesitant to use sealer as I see how they usually fail after time and look way worse. I may experiment and beeswax is on my radar… Good luck.